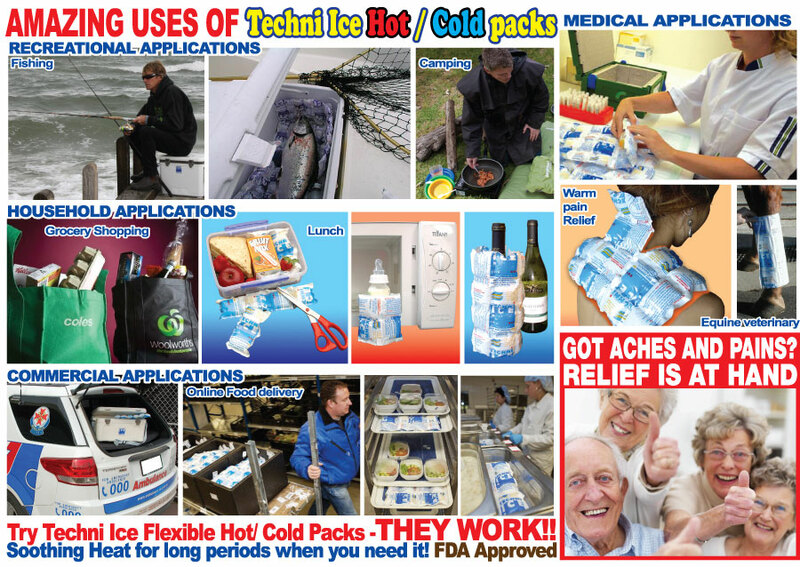 - Camping &amp; Fishing: As a reusable long lasting ice replacement for coolers, cooler bags Ice and boxes for keeping food and drinks both hot or cold. - Shopping: These Dry ice packs are ideal to Bring frozen food and ice cream home from the supermarket. - Electricity: During blackouts for taking Techni Ice from the freezer &amp; placing in the refrigerator to keep refrigerator cold while electricity is off. - Medical: Leading Pathology Labs Across the world use these in Transportation of y Samples, e.g. blood, tissue, medicine, e.t.c. - Hospital: Several Hospitals around the World Cut these Flexible Dry Ice packs to size for the reduction of swelling after surgery, or for perineum after childbirth, after an epidural as an ice-cold test, e.t.c.